An international team of scientists have developed a new synthesis method that enables the production of wafer-thin carbon layers for a wide range of applications. Scientists have developed a promising nanomaterial that may be adaptable for use in a wide range of applications. An international team headed by scientists from the Swiss Federal Institute of Technology Lausanne (EPFL) and the Max Planck Institute of Colloids and Interfaces in Potsdam-Golm has developed an elegant method for producing self-organized carbon nanolayers and equipping them chemically with a range of functions. Such functionalized carbon nanolayers are believed to be suitable for various applications. For example, they could act as coatings that make surfaces both scratchproof and dirt-repellent, or as sensors for the detection of extremely small amounts of substances. The electrical conductivity of carbon layers also makes them suitable for use as electronic components in various applications. In the technology of tomorrow, something inconceivably small could well become a giant. Scientists are researching many variants of nanomaterials, namely substances with dimensions in the range of 100 nanometers. The prefix nano stems from the Greek word for dwarf, and refers to one-billionth part. Thus, a nanometer is a billionth of a meter. Scientists are very taken with one particular material which comes in these dimensions: carbon nanolayers. These are honeycomb-like layers of carbon atoms that are a few nanometers thick – or even less. The thinnest conceivable carbon nanolayers of this kind are graphenes, which consist of a single layer of carbon. For many applications, it would be important to be able to equip these ultra-thin carbon sheets with certain chemical molecule residues, known as functional groups. “This has only been possible to a limited extent up to now because carbon nanosheets can usually only be prepared at extremely high temperatures – and, therefore, under conditions that would immediately destroy such functional groups,” explains Gerald Brezesinski from the Max Planck Institute of Colloids and Interfaces in Golm near Potsdam. Together with colleagues from his Institute, Brezesinski has provided support for researchers from the Swiss Federal Institute of Technology Lausanne (EPFL) in developing a synthesis approach that could be of interest in this context. Using this method, carbon nanolayers, including functional groups, could be accessible at considerably lower temperatures than those usually applied in the production of such materials. To form a planar structure from carbon atoms, the Swiss researchers deployed a series of tricks. One of the main ones concerned the selected starting compound, a molecule whose middle section has six alternating carbon-carbon triple and single bonds. These sections consist exclusively of carbon atoms and are highly reactive, as they can also undergo chemical reactions at lower temperatures. In contrast to other processes, this means that thin carbon layers can be produced from these molecules at room temperature. Using a special test set-up, the scientists arranged for many of these molecules to align perfectly in parallel to each other in a single self-organized layer –like the bristles on a brush. However, there was one small difference to the brush bristles: the parallel chains of molecules each had one slight bend. As a result of this arrangement, the carbon-rich sections of all molecules were located at the same level. When the researchers applied UV light to this set-up, some of the triple bonds broke up and bonds were formed instead between the carbon atoms of neighboring molecules. Because almost all of the bristles were thereby eventually bonded with their neighboring bristles, a consistent layer of carbon atoms arose – a carbon nanolayer. To enable all of this to happen, the Lausanne-based scientists clearly had to dig deep into the box of chemical tricks for the design of the molecular precursor. In order to ensure the parallel arrangement of their molecules, they devised surfactant-like molecules, similar to those found in dishwashing liquid. While one end of such molecules dissolves well in water, the other does not dissolve at all. Between these two ends, the scientists placed the reactive triple bonds. When they brought their compound into contact with water at this point, only one end of the molecule dissolved. The entire remaining residue was so insoluble that it protruded from the surface into the air. The researchers succeeded in deliberately setting a uniform distance between the individual molecular bristles. On the level of the triple bonds, this had to be smaller than 0.4 nanometers, as the neighboring carbon atoms are only close enough to each other in this case to form new bonds with each other under UV light. For the scientists, it was important to understand how the molecular layer along the water-air boundary actually looked, and how it changed in the course of the reaction. Special methods came into play here, which are part of the repertoire of Gerald Brezesinski and his Research Group at the Max Planck Institute of Colloids and Interfaces in Potsdam. For example, to detect the position of the relevant atoms in the boundary layer – and thus also the exact arrangement of the starting molecules – the researchers used high-energy x-ray beams from the DESY synchrotron in Hamburg. The ways in which these beams were scattered or reflected on the wafer-thin sample layer eventually provided Gerald Brezesinski and his colleague Cristina Stefaniu, who now works at the University of Potsdam, with information about the exact arrangement of the starting molecules. With the help of infrared reflection-absorption spectroscopy, the scientists later succeeded in tracing the actual reaction during the UV irradiation. To do this, they measured how the characteristic signal of the triple bonds declined continuously over the course of the reaction. A very special technique used by the researchers in Potsdam was helpful here. Disturbing influences from the water molecules present could only be masked with the help of this technique. “There are only a few research groups in the world that can make this kind of infrared spectroscopy in such layers visible,” stresses Gerald Brezesinski. Special techniques used by the Potsdam-based Max Planck researchers also proved helpful in characterizing the resulting product. These included, for example, the Brewster angle microscopy, which was developed around 20 years ago at the Max Planck Institute for Biophysical Chemistry in Göttingen. 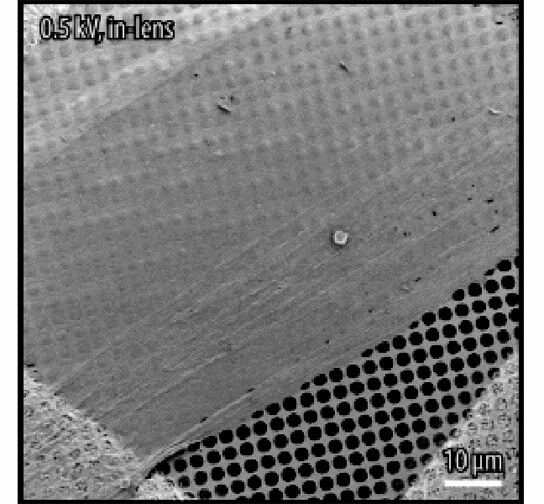 With the help of this microscope, the researchers were able to show that the product was a very homogenous smooth layer, which is a total of two nanometers thick – and, therefore, actually a carbon nanolayer. At the end of the synthesis process, the ends of the starting molecules still protruded from the nanolayer – the water-soluble end on one side and the insoluble end on the other. This particular factor is extremely important for the researchers, as it creates the possibility for attaching chemical groups on the end prior to synthesis that will give the subsequent carbon nanolayer a special function. The chemical appendages would withstand the mild production process undamaged, and would also be conserved in the resulting carbon nanolayer. In this way, for example, it would be possible to anchor chemical groups on one side that would later support the connection to certain surfaces made of glass or metal. Groups could also be attached to the other side that would make the layer dirt-repellent. The carbon layer itself would also make the surface very scratch-resistant. Chemical nanosensors could also be constructed from such wafer-thin layers. To this end, chemical groups could be integrated into the starting molecules which later ensure the interaction with the substance or substance group to be measured. The high electrical conductivity of carbon nanolayers could then be used for the transmission of the measurement signals. The researchers from Lausanne and Potsdam hope therefore that their innovative process for the production of self-organized and functional carbon nanolayers will pave the way for a large number of interesting new applications. Be the first to comment on "Scientists Develop New Method for Producing Self-Organized Nanomaterials"